I have felt from the beginning of my season of suffering that Satan would love nothing more than to get his toe in and just go ahead and finish our family. From the get go, I felt in my heart of hearts that one of my biggest battles wouldn’t be processing all the grief or paying the bills or even the day to day of raising kids as a single mom. I’ve felt that my biggest battle in this whole thing has been a spiritual battle. My enemy has not been grief or a heart attack or the broken water heater. There is an enemy of my soul and the souls of my seven children. And he would like nothing more than to use our tragedy to complete the job. Oh how he’d love to mess with our minds — to convince us that God isn’t really in control and that God will not really take care of us. How he’d love me to live in fear, to parent out of fear and to cower at what life might dish out. He’d love to take all the good that God has done, all the beauty and the gifts that God has given — and is giving — and forever mar our life as ugly, broken, less than what it could-should-would have been. Satan hates a strong family. He hates a family who is following after God and is in the Word and trying their best to raise children who love the Lord with all of their hearts. He really hates God, but strong families are in the way. Steal our trust, kill our hope, destroy our families. This is the work of Satan and we can see it all around us. Satan is chasing hard after families and the wreckage is piled up in our neighborhoods, in our schools, in our churches. Satan loves to work hardest when we’re at our weakest. Isn’t that exactly what the devil did to Christ? Not even God himself, while clothed in humanity, was immune to Satan’s attempts to destroy. Satan came at Jesus when he was alone, in the wilderness, surrounded by wild beasts and weak from fasting for 40 days. Satan didn’t come at Jesus when He was teaching in the temple or surrounded by his 12 apostles. He chose to attack Jesus spiritually when Jesus was isolated and weak in a barren wilderness. And the devil didn’t just try it once. Oh no. He kept coming back, coming at Jesus three times in quick succession and each time attacking with lies. But every time Satan threw out his lie, Jesus soundly refuted it with the truth of scripture. The Word that became flesh for us refuting with His word. That is precisely what we have to do. Every single time Satan throws a lie at us, we need to refute it with scripture. Look at the statistics. How can you possibly think kids raised in a home without a father will be okay? You cannot single parent. You sure don’t have the wisdom to do this. God will not take care of you. Does God really love you? Cause if He does, why does life look like this right now? Well, if forewarned is forearmed, we know the enemy of our souls will kick us while we’re down. When we are weak, when our finances tank or we get a diagnosis or tragedy strikes, that’s when Satan works overtime. Every time he throws a lie at us, we have to confront it head on with the truth of scripture. The daily exchange. Daily exchanging despair, weariness and lies for God’s promises of hope and life. Have you sensed Satan coming at you in your weakness? When Satan whispers in your ear, call it the lie it is, open the Word and with every breath in your soul replace it with God’s solid truth. If you’d like to get encouragement delivered right to your inbox, subscribe here and I’d love to send my free 100 Days with Christ Bible study and journal. *This post is part of the 31 Days: Braving the Broken series. Go here for all posts in the 31 Days: Braving the Broken series here. Just wanted you to know I’ve been reading faithfully and reaping great comfort from this series. I also have been forwarding to my loved ones who are going through their own seasons of suffering. God bless you! Thank you for letting me know. I pray that it helps us draw toward God. He is good. This one wrote itself. Lisa, what a beautiful and encouraging post. I love how you show the lie, then share scripture of the truth. Praise God, He is faithful, and what an amazing work He is doing through your family. Thank you for sharing this today. This good word from the Word will bless many. I’m sorry for your loss. I have several friends who have lost their husbands, and I know this will bring encouragement to them. Thank you Doris. So grateful God gives us His truth and the example from Jesus. I appreciate you sharing with others that are hurting. What a good word, Lisa! I found your post today on Grace and Truth. Good Friday morning, Lisa. We’re neighbors at #stressless this morning, and am I ever glad we are. This is another good post! I could have used this during Tony’s deployments, to bath my mind in truth and encouragement. So good, my friend. So good. Leann, so glad these words minister. This couldn’t be more true! I have found that the way Satan has gotten a foothold in my life is by making me feel isolated during my parents’ divorce. Even though I was an adult when it happened, it still had a tremendous impact on my life. 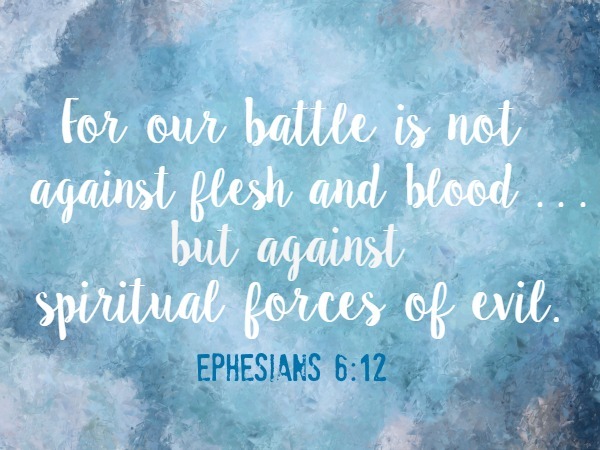 At the time I felt like my family was unwilling to support me through that difficult season, but now that I have had time to reflect I realize that it was a prime example of spiritual warfare. It has been quite a long journey to forgiveness, but I am thankful that I have made great strides toward repairing the relationships that the enemy worked so hard to destroy forever. Your email is meeting me right where I’m at … Our daughter 24 yrs old) was in a bad car accident a week ago today. She has been on life support in ICU ever since. I am appropriating your strategy to meet satan’s attacks of fear and lies. Thank you so much!! So many times, I let those lies from Satan slip on by without recognizing them for what they are. Thank you for the reminder and the inspiration- I needed it this week. Lisa, you so beautifully articulate your experiences. This post is amazing! I’m going to share this post with my FB group, knowing your words (of God’s words) will meet many right where they are at this very moment. Thank you for allowing your own journey to be peeled back and revealed to us in order to encourage and to point us to the Truth and the faithfulness of God. Lisa, WOW! Just what I needed to hear today as a single mom as well! The lies you shared that Satan tries to fill your head with are the exact same lies he tries to get me to believe! He is such a LIER! I am going to take the verses you shared and memorize them. They were right on point for fighting Satan and his lies off. I also have to remind myself also that the more I work harder to raise my boys up in the Lord, the more upset Satan is going to get and he will try to attack me even more!! I love what Tracie Miles says in Stressed-Less Living, “If you only use one weapon to fight off stress, let it be God’s Word.” Thank you so much for sharing your heart today, God used you to speak to me!! Yes, I love that from Tracie! So glad this is helpful, Natalie. This really hit home for me. As a working mother and youth pastor’s wife, I hear Satan’s lies all the time. Thank you for pointing to Scripture to rebuke these lies. Sam, ugh on both of these. I hate that working mamas or those on church staff hear the lies. But Satan surely knows our spot. Thank you for sharing how you are standing–you are strengthening the spines of others with your testimony! Sharing on my FB page this week. Thank you, Sherry, for your encouragement. I can’t tell you how much this applies to my life, over the last 14 years! The attacks getting stronger, with each strike against me! Thank you for this necessary reminder. I’m so sorry, Sherri! But knowing what we’re up against is half of the battle.